Whilst the most popular time to visit Scotland is the summer months, there is plenty to do in winter in Scotland. We’ve travelled throughout Scotland in winter, and with a bit of preparation and planning, a visit at this time of year will reward you with quieter and less crowded attractions (with some notable exceptions!) and wintery landscapes in the Scottish Highlands. 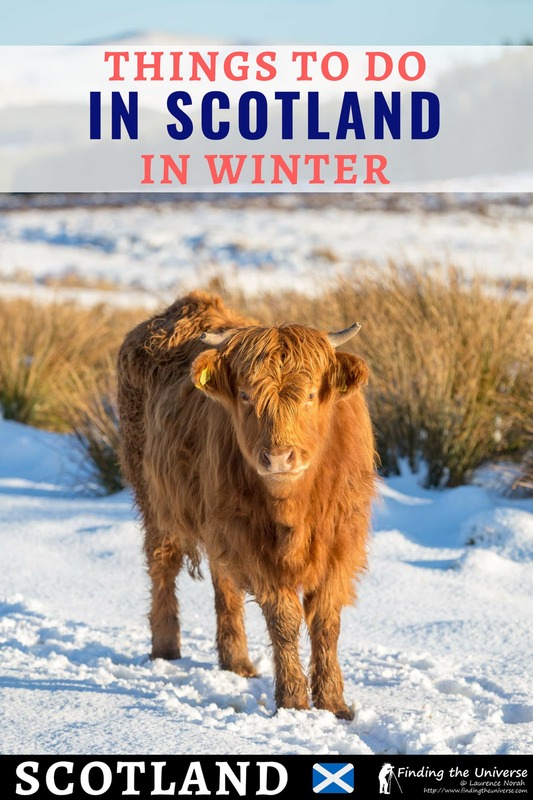 In this post we’re going to go through some of the many highlights and reasons to visit Scotland in winter, including some of our favourite things to do in winter, as well as some tips for preparing for a winter visit to Scotland. Let’s get started! First, we want to go through some of our favourite activities in Scotland in winter. Some of these are exclusive to visiting Scotland in winter, others can be enjoyed year round. Scotland is home to six outdoor ski resorts, found in the more mountainous regions of the country. 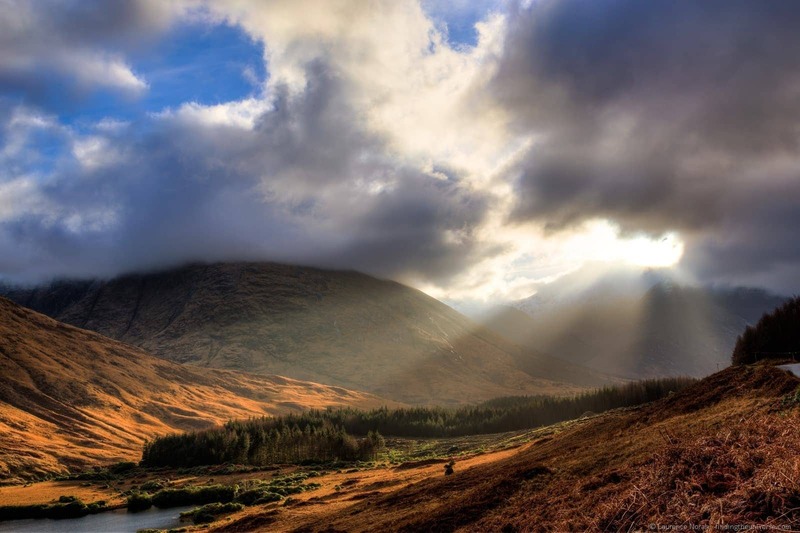 These include three resorts in the Cairngorms National Park, and one in the beautiful Glencoe valley. There are also a number of other artificial ski slopes in the UK, but if you want real snow, the six ski resorts in Scotland are the only place in the UK to come for ski slopes with real snow. Whilst the mountains in Scotland are not as high as those you might find in say the Swiss Alps or the Colorado Rockies, there is certainly good skiing or snowboarding to be had, with all the resorts offering everything you might expect, including well groomed slopes and ski lifts. Generally, the ski resorts in Scotland are open from around December through to April, but this will depend greatly on the weather conditions and snowfall. February is generally the month with the most reliable snow cover. 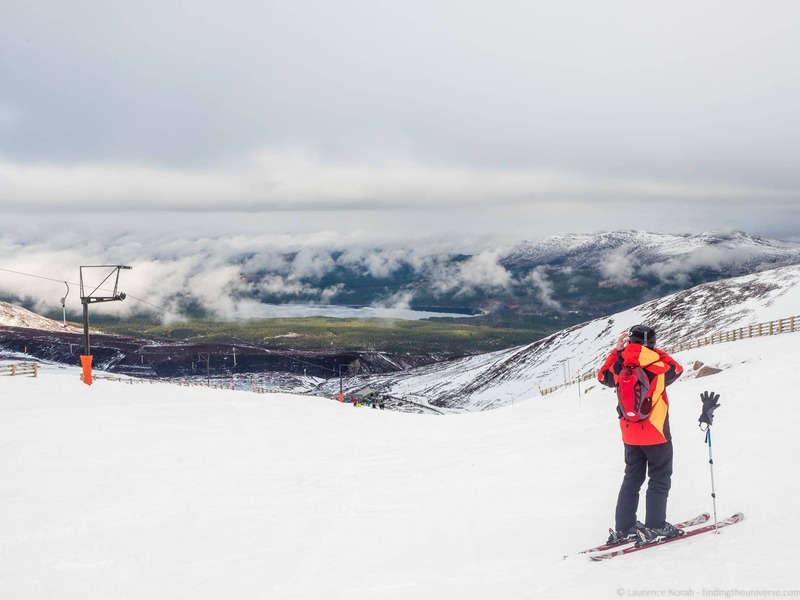 We have a full guide to all the Scottish ski resorts here, plus a detailed overview of our experience skiing on Cairngorm Mountain, to help you plan your own Scottish skiing adventure! If you’re visiting Scotland in December over the Christmas and New Years Eve periods, then you might want to look into the many events and activities that happen around this time. Many of the cities and towns across Scotland host some sort of Christmas event, which may be anything from festive Christmas light shows through to Christmas markets. In Edinburgh for example, the Edinburgh Botanic Gardens is often festooned with a special light display, and the Edinburgh Christmas Markets run from the end of November through to the beginning of January. See more about what’s on in our guide to Edinburgh at Christmas. If you happen to be in Scotland for New Years Eve, you are definitely in for a treat. New Years Eve, known as Hogmanay in Scotland, is a massive event here, with a wide range of events happening across the country. Certainly one of the most popular places to be for Hogmanay is Edinburgh, which hosts one of the world’s largest New Year’s Eve celebrations. This includes a massive street party, traditional Scottish dances, performances from musicians and street performers, and a huge fireworks display over the castle to mark the event. There’s also a huge torchlight procession through the streets of Edinburgh on the 30th of December, as well as the annual Loony Dook on the first day of the New Year, as well as a number of other events. 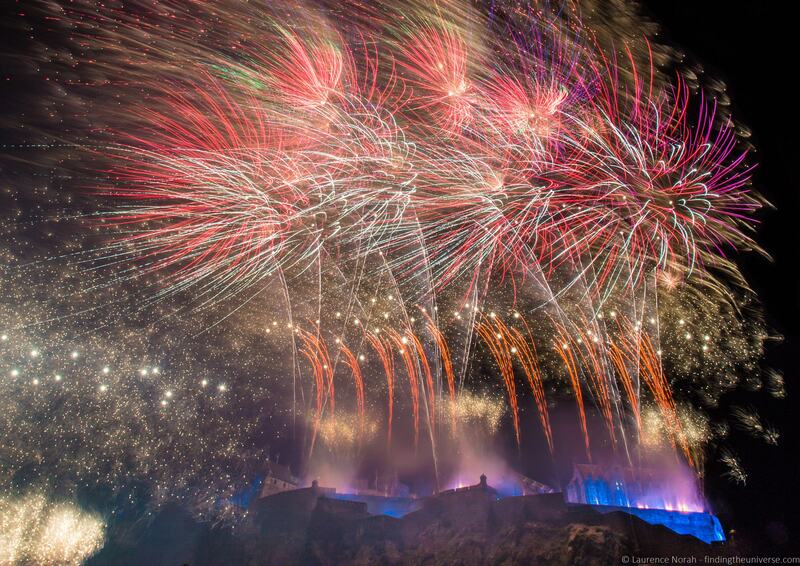 If you plan on visiting, check out our detailed guide to Hogmanay in Edinburgh. We love road tripping in Scotland in winter. There are far fewer cars on the roads, accommodation prices (especially for high end castle properties like this) are incredibly reasonable, and the scenery is just as spectacular. Other advantages are the wonderful light, and your chances for seeing some wildlife like deer are increased, as they come down from the high mountains to find food that isn’t covered in snow. Of course, there are a few things to be aware of. Roads can be icy or snow-filled (especially in the mountainous areas and up north), and the hours of daylight are much shorter, giving you less time to fit everything in. So you will have to plan accordingly and you will want to be flexible. Also note that many attractions outside of the larger cities close during the winter or have reduced winter hours. So keep this in mind when considering when you want to visit and in your trip planning. With proper planning though, a road trip in Scotland in winter is definitely worth considering. We’ve driven the North Coast 500 in winter, as well as the Cairngorms, the Isle of Skye,, and the North East 250. We usually carry snow chains in our car (we’ve not had to use them yet!) if heading to northern Scotland, and then it’s just a question of planning the itinerary so we don’t go too quickly, and checking for hotels that are open, as many are closed through the winter months. We have been snowed in once, but as we had a flexible schedule, we just ended up staying an extra night where we were. If you miss Hogmanay or the Christmas Markets, fret not. There are lots of other festivals through the winter months in Scotland. In Scotland in January for example, Burns Night is celebrated. This celebrates the life of Scotland’s most famous poet, Robert, or “Rabbie” Burns, and is held on the 25th January each year – the birthday of the poet. The festivities vary, but the most common celebration is an evening meal, which will feature readings of poetry, traditional Scottish food, and traditional Scottish dancing. Various locations across Scotland hold different events at this time, from formal dining at locations like Prestonfield House through to festivals like the Dumfries Big Burns Supper. See our full guide to celebrating Burns Night in Scotland, which has lots of events and information to help you plan. Other festivals including the Up Helly Aa viking festival in the Shetland Islands at the end of January, and the celebrations of Scotland’s Patron Saint, St. Andrew, on the 30th November. If skiing or snowboarding doesn’t float your boat, there are plenty more opportunities for winter fun in Scotland. For example, in the Cairngorms National Park you can go dogsledding with the Cairngorm Sleddog Centre, go sledging at a variety of locations, and even go snowshoeing. Across Scotland, there are a wide variety of options for wintery activities, from ice climbing to winter mountaineering. If this sounds like your sort of thing, we recommend getting in touch with Tim from Hamlet Mountaineering, who should be able to arrange something fun to do! Or, you could just go for a nice walk and enjoy the snowy landscapes. Whatever works for you! With the notable exception of the period over Christmas and New Year, visiting Scotland’s cities in winter will reward you with a quieter experience. This will let you enjoy all the attractions they have on offer, but with less fellow visitors around you. In our experience, most of the major attractions in Scotland’s cities remain open throughout the year, and of course there are plentiful restaurants, shops and cafes as well. The colder weather won’t matter so much if you spend your time indoors, and if you visit in the run up to Christmas, you’ll be able to appreciate the pretty Christmas lights as well. As examples of popular attractions that are open year round, but which are generally much less busy in the winter, there’s Edinburgh Castle and the Royal Yacht Britannia. These are some of Scotland’s most popular attractions, with millions of visitors a year, and winter will be a much quieter time to visit. Another popular activity in Scotland is a cruise on Loch Ness, and these also run year round. This can be done as a day trip from Inverness, Glasgow or Edinburgh. Of course, you’ll want to be sure that any holidays don’t affect operating hours. The major holidays at this time of year are the 25th and 26th of December, and the 1st and 2nd of January. It’s also worth being aware that school holidays, Christmas and New Year are generally busier times in Scotland’s larger cities. The three cities we’d recommend for the most attractions open year-round are Edinburgh, Glasgow, and Aberdeen. But you’ll also find things to do year-round in other cities such as Inverness, Dundee, Stirling, and Fort William. We have some guides to visiting Scotland’s major cities, including things to do in Edinburgh, things to do in Glasgow and things to do in Aberdeen, which will get you started with planning your adventure. What could be more Scottish than sipping a whisky (preferably by a roaring fire), whilst the winter weather howls at the door? Pretty much nothing. 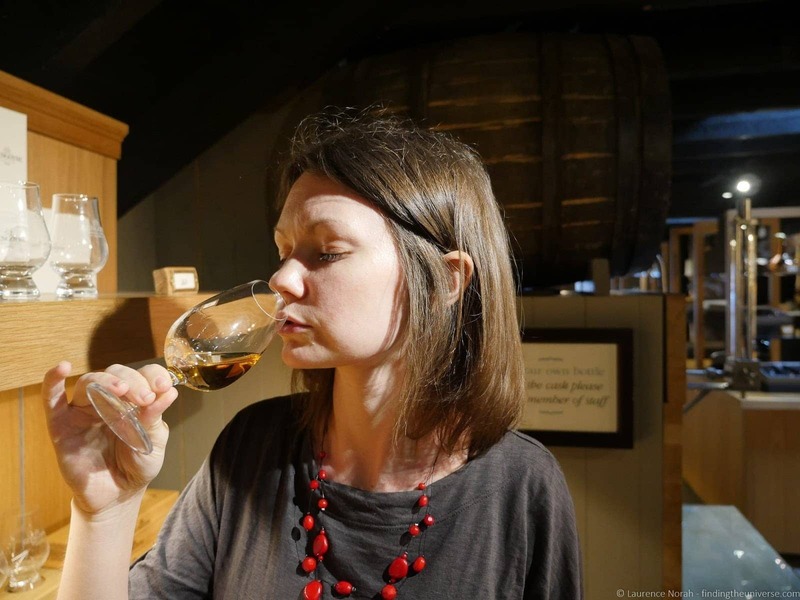 Even if, like Jess, you’re not a huge fan of whisky, we would suggest that a whisky tasting tour is still an essential part of any visit to Scotland, and you can read about our experience taking a whisky tour from Edinburgh here. When you visit one of the distilleries, you’ll learn all about the way that whisky is made, what makes Scotch whisky so special, the different varieties and flavour profiles of whisky in Scotland, and of course, you’ll get to try some of the good stuff. There are a wide range of whisky tours you can take in Scotland, which range from day trips like this to multi-day experiences like this. Another option, if you’re in Edinburgh and don’t want to commit to a day out, is to visit the Scotch Whisky Experience on the Royal Mile. This will take you on a journey through all of Scotland’s whisky distilling areas, teach you all about how whisky is made, and even take a look at the largest Scotch whisky collection in the world before sampling a dram of the good stuff. There are also a number of whisky walking tours in Edinburgh, which you can see here. You might not know this, but it is actually possible to see the Northern Lights, or Aurora Borealis, from Scotland. Of course, you have to be fairly lucky – there needs be a strong enough solar storm to make the lights visible this far south, and the skies have to be clear. If these two factors happen to come together (this does happen rarely! ), then you may be rewarded with a spectacular display. The Northern Lights have been seen in Scotland as far south as Edinburgh and the Scottish borders region, so you don’t even need to head to the far north of the country – although your chances of seeing them are much higher if you go further north. In addition, as the population density in the northern parts of Scotland is much lower, there is far less light pollution. 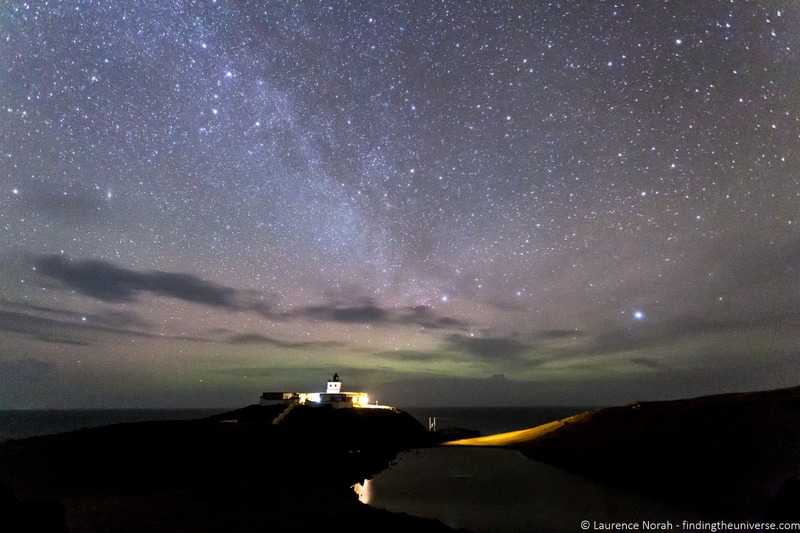 Along the north coast of Scotland and in the highland regions in particular there is very little artificial light, meaning the views of the night skies are pretty stunning. Even if you don’t get to see the Northern Lights themselves, if you are lucky enough to have a clear night you will be rewarded with gorgeous views of the stars. One thing that we love about travelling in Scotland in winter is how wonderful the light can be for photography. Whilst the days are shorter, the sun stays low in the sky, meaning that it’s pretty much golden hour all day. If you happen to be lucky enough to have a little bit of dramatic cloud cover, but not so much as to obscure the sun, then you could end up with some really stunning photos. There’s no shortage of fantastic photography locations in Scotland to take advantage of the light. Some of our favourite locations to shoot include Glencoe, these photography location on the North Coast 500, and these photo spots on the Isle of Skye. For some tips for shooting at this time of year, see our guide to cold weather and winter photography. 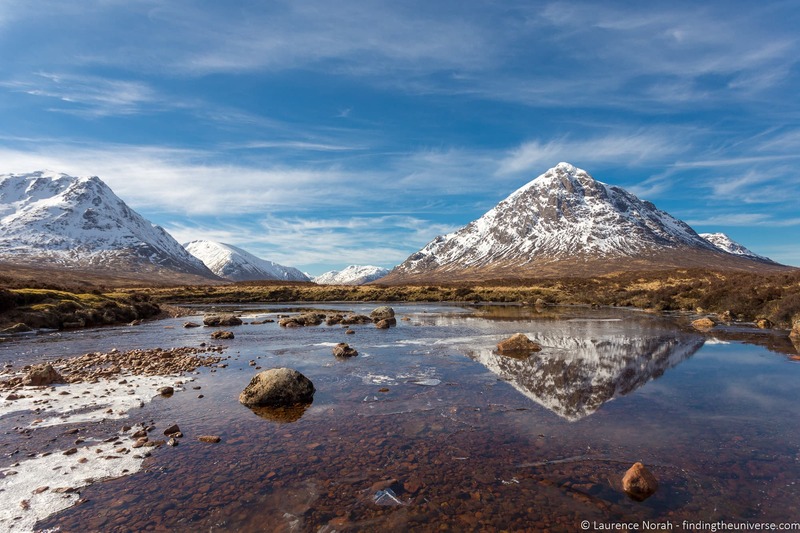 Hopefully all of the above have given you some inspiration for planning your winter trip to Scotland. Now, to help you prepare for your trip, we wanted to give you some planning advice so you can make the most of your adventure. Despite its northerly latitude Scotland has a relatively mild climate year round. This means you don’t get temperatures far below freezing in winter, or much above 25C / 77F in summer. That said, winter in Scotland can certainly be cold, especially if the wind is blowing from the north, which can make the perceived temperature much lower. 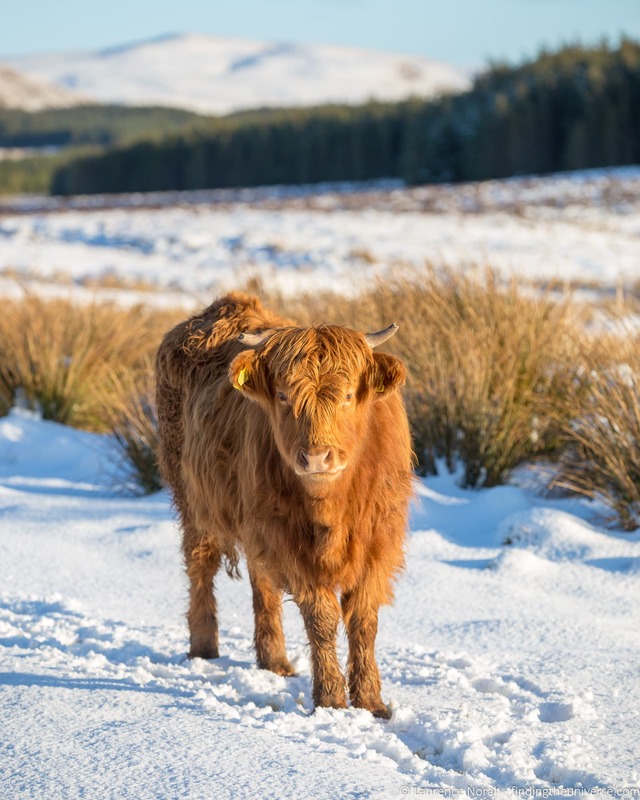 Snow in the lowlands is possible but uncommon, whilst in the Scottish highlands snow is more likely from December through to March. Rain is also a possibility throughout winter as well. Temperature wise, from December to March you can expect temperatures in the range of just below freezing to around 12C / 53F. 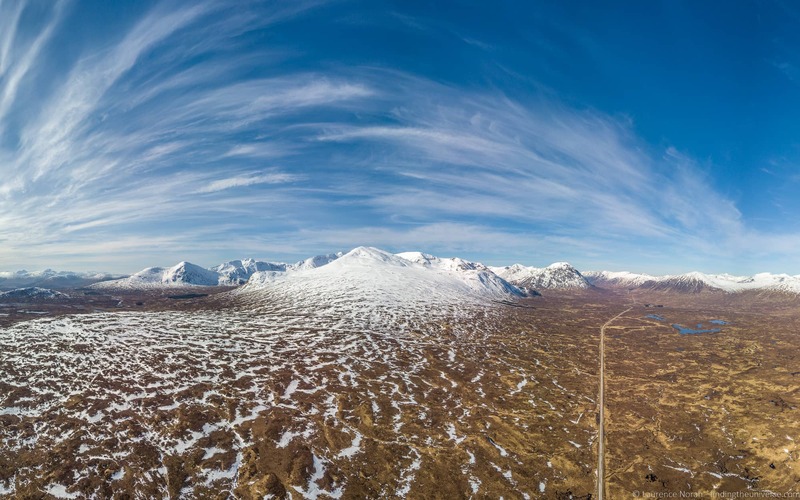 As you see from the above, you can expect a range of weather conditions in Scotland in winter! As such, our advice is to pack a variety of lightweight layers that you can put on and take off as the conditions change. We would suggest thermal baselayers for the coldest days, a fleece mid-layer, and, perhaps most importantly, a warm coat. Qualities to look out for in a coat include wind and water proofing. We would also suggest you bring a warm hat, gloves and a scarf, as well as a good pair of hiking pants. For rain – we advise a rainproof jacket with hood or bring a poncho or very sturdy umbrella that can withstand wind. If hiking, bring a waterproof cover for your pack and gear. For footwear, if you’re planning on hiking, then a sturdy pair of shoes are recommended, and we’d generally recommend waterproof shoes anyway as wet feet can quickly make a day miserable. If you’re visiting Scotland from outside the UK, you are likely going to need a travel adaptor like this so you can plug your devices in. If you’re like us and have a lot of electronic gear, we suggest you travel with a power strip like this, which you can plug into your adaptor. This might seem obvious, but it’s worth remembering that Scotland in winter has far fewer hours of daylight than Scotland in summer. For example, in mid December, you only get seven hours between sunrise and sunset. This is important to keep in mind if you are planning a road trip or other activities that are best done in the daylight. Our advice for this sort of trip is to reduce the number of things you try to do each day, and try to avoid driving at night if you can, as you’ll miss out on the scenery that you came here to see! Driving in Scotland in winter is definitely a different experience to driving in summer. 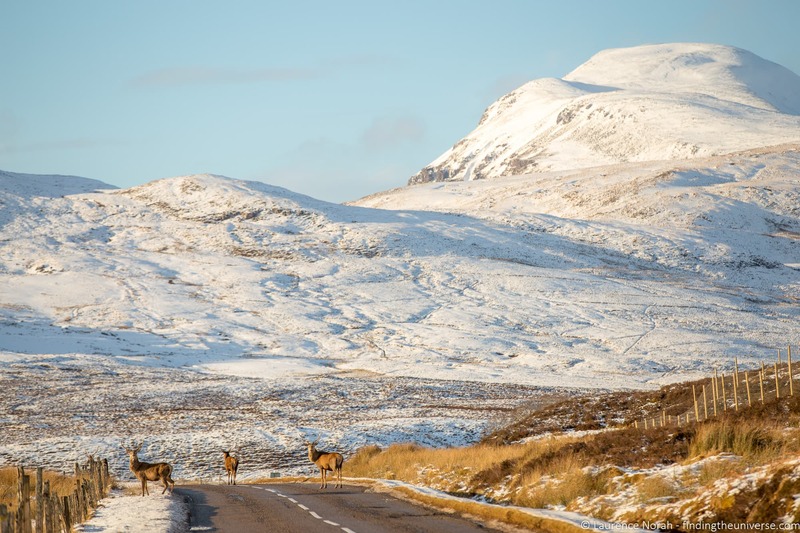 In the northern parts of the country, and especially the highlands, snow is not uncommon, and icy conditions can make roads dangerous to drive on. Deer and other animals are also common on the roads after dark. We’re not saying you shouldn’t drive in Scotland in winter, but you should definitely drive to the conditions, and stick to the more major roads where possible, which are more likely to have been treated for snow and ice. For more advice, see our guide to driving in the UK. If you’d rather not drive yourself, there are plenty of group and private tours available in Scotland year-round. Our favorite company Rabbies is based in Edinburgh and offers day trip and multi-day trips throughout Scotland. Tours are often not full this time of year so it’s a good time to take one. 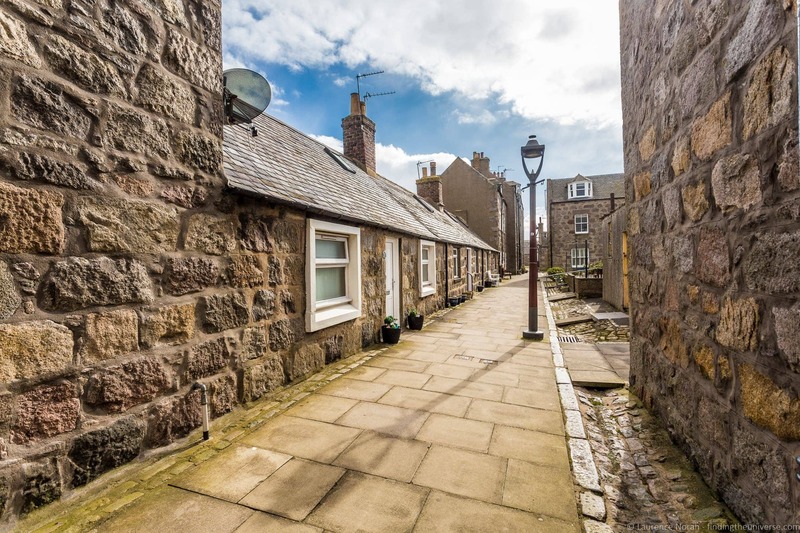 Finding accommodation in the major Scottish cities in winter shouldn’t be a problem, as the majority of the hotel and other accommodation options are open year round. The only time of year where accommodation becomes a bit harder to find in the cities is around New Years Eve, particularly in Edinburgh, where the city becomes very busy. 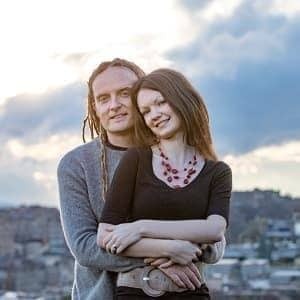 See Edinburgh’s listings on booking.com here. The story is a bit different when you head out of the cities, and particularly into the highlands of Scotland or the North Coast 500 driving route. In these regions, a lot of properties have traditionally closed over the winter periods, especially the B&B’s and smaller guesthouses. This is either because they are unable to get staff, or because there hasn’t been enough visitors at this time of year to make opening. This presents the traveller with both challenge and opportunity. The challenge is to find properties that are open. The opportunity is that many hotels offer incredible deals at this time of year – especially the higher end properties that stay open year round. As examples of some hotels we’ve stayed at for fantastic deals in the winter months, take a look at Inverlochy Castle near Fort William or Bunchrew House near Inverness. Otherwise, it’ll just be a question of putting your dates in to booking.com and planning ahead. We know that one of our favourite B&B’s on the North Coast 500 is open year round for example. 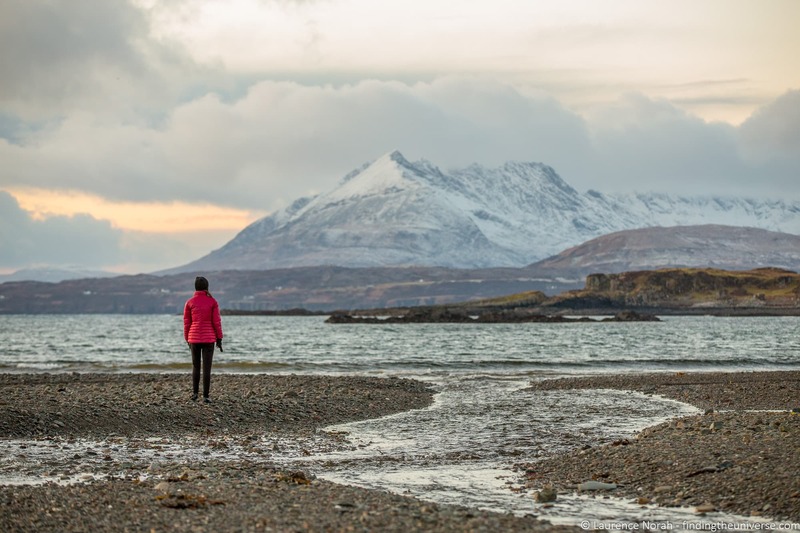 Hopefully this post has given you some ideas of what to do in Scotland in winter! To help you further plan your trip we have written a number of other posts about travelling in Scotland and the wider UK. Here are some to get you started. If you’re looking for road trip inspiration, we have a Skye and Highlands itinerary, a guide to the North Coast 500, a 3 day North East 250 road trip itinerary and a 5 day NC500 itinerary to get you started! We also have lots of content across the wider UK, including a 2 week UK road trip itinerary, a guide to visiting Oxford, a 3 day London itinerary and lots more! For general planning information, see our guide to the cost of travel in the UK, as well as our guide to driving in the UK. And that’s it! As always, we’d love to hear your questions and feedback about this post, or travelling in Scotland in general. Just use the comments section below, and we’ll get back to you as soon as we can! Great article as always…..have to get back to Scotland soon! Wow, very fast response! Thanks for the additional information…..